Melissa C. Koh and James Chen celebrate their wedding anniversary by going glamping in Singapore in a luxury tent, styled with beautiful pampas grass and protea arrangements in a coastal colour palette! We were so excited when this gorgeous glamping styled shoot landed in our inbox! Its beautiful bohemian styling and chic glamping inspiration is perfect for couples who want to celebrate love and connect with nature at the same time. “To celebrate the wedding anniversary of Melissa C. Koh and her husband James Chen, we wanted to create a free-spirited, bohemian glamping editorial for lovers who have a feast together,” shares Natalie Wong Photography, who captured their time together. Perfect for nature-loving couples, this shoot shows you how to go glamping in style, right here in Singapore. 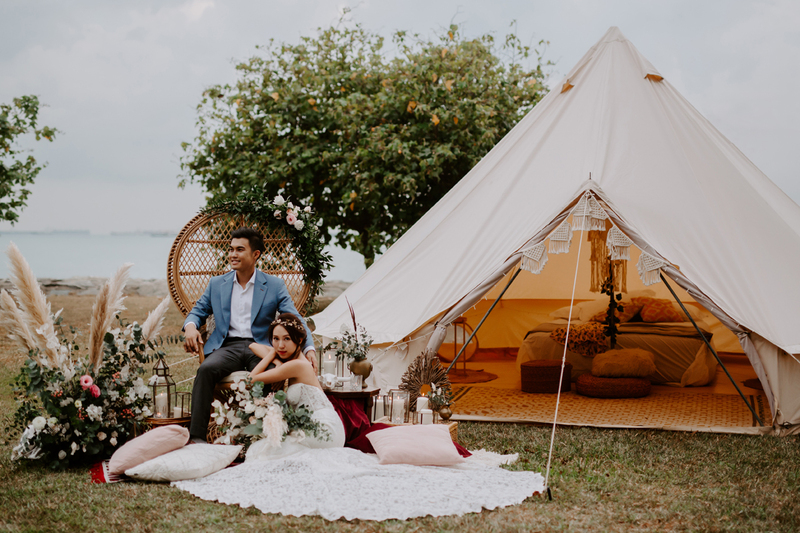 Set against views of the blue seas at East Coast Park, the shoot captures Melissa and James as they connect with nature in the intimacy of a luxury tent from The Glamping City. The lovers cosy up in a hammock from Airmocks in a field of lush green grass, enjoying the sea breeze, and feed each other bites of cake and cookies in a beautifully set out dessert table in celebration of their anniversary. Melissa wore a lace wedding dress with a sweeping train from Frieda Brides, paired with footcuffs from Anna Campbell Bridal and a delicate headpiece from Maggie Wu Studio. To complete Melissa’s indie, bohemian look, Iheartblooms gave her natural and ethereal makeup and a casual updo. James wore a blue suit from Assemble to complement the free-spirited, casual vibe of the shoot. The team used shades of ivory, warm sand, and burnished bronze, with pops of rich mahogany and mauves to accentuate the luxe bohemian theme. The Dessert Party styled the set with an earthy, bohemian feel using a floral-adorned peacock chair, patterned rugs, throw pillows, vintage décor accents, and plenty of romantic candles. They also created a beautiful low dessert table where Melissa and James could relax and savour a time of connection. Fleur Boutique crafted wild and bohemian floral arrangements featuring golden pampas grass, huge proteas, and eucalyptus. Handmade deckle-edged stationery from Mylin Design Co. added a note of romance to the set. The creative team hope that this unique glamping styled shoot will inspire your own adventure of love! “We want to show couples how to put the “glam” in camping so they can let loose and connect with nature, in style,” they share. Thank you, team, for sharing this beautiful bohemian glamping styled shoot with us! Want to see your wedding work featured on SingaporeBrides too? Send your submissions here!